Do you ever feel like there’s a part of you that doesn’t match type descriptions? A lot of INTJ descriptions make out the type to be very cold, aloof, and unfeeling. This can be surprising to many INTJs who actually feel very in touch with their feelings, values, and emotions. The tertiary function is what gives many personality types their unique nuances that contradict stereotypical assumptions. Most books and web sites focus almost exclusively on a type’s dominant and auxiliary functions. The tertiary function is rarely talked about or addressed and so many people may not feel fully aligned with their type description. INTJs who are experiencing a “Ni-Fi” loop will not match up to the typical INTJ type descriptions. They may seem to others to be more like imbalanced, reclusive, IXFPs. To understand the INTJ loop we need to take a look at their cognitive function stack. 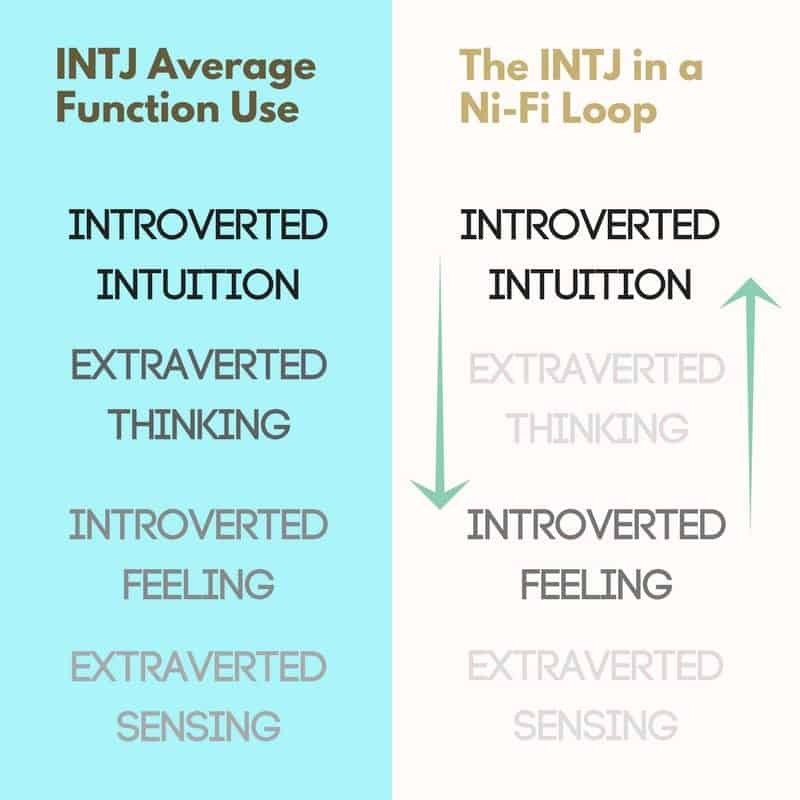 As you can see in the graphic above, an average INTJ will have strong use of Introverted Intuition, followed by Extraverted Thinking, Introverted Feeling, and Extraverted Sensing. In the graphic you can see that the influence of each function becomes lessened as you move down the function stack. When an INTJ is looping, they have diminished use of their auxiliary thinking function. In fact, they bypass thinking and go straight to feeling. Then they loop back up to intuition, then back to feeling, over and over again. This is not a healthy state for the INTJ to be in and usually results in imbalanced decision-making, irrational fantasies, and loss of focus. What is the Use of the Tertiary Function? In most cases, the tertiary function aids and “checks in” with the auxiliary function to ensure that decisions are being made with balance. Because the INTJ uses Extraverted Thinking (Te) as the auxiliary function, Introverted Feeling (Fi) balances Te and questions Te-motives and agendas. It ensures that the INTJ not only makes the most logical decision, but makes a decision that aligns with their values and morals. Fi gives the INTJ a determination to stay true to their own identity and individual moral code. INTJs who use Fi proficiently can take time to understand how their decisions affect not only themselves, but the people around them. Before we get into all the manifestations of the Ni-Fi loop, let’s figure out what Ni and Fi are. Introverted intuition is an ability to understand how the world works through internal analysis, insight, abstract thought, and symbolism. Ni users have the ability to easily spot patterns and trends that will lead to a future outcome. They get strong hunches and “gut” feelings out of nowhere that are related to an unconscious synthesis of sensory data. The ability to deeply understand one’s own emotions and values. Fi users have a strong moral compass and believe in being authentic and true to themselves and their identity. For the young INTJ, Fi-use is often erratic and unpredictable. It’s not nearly as comfortable for them to use as intuition and thinking. They may repress negative emotions one day and then dwell on them the next. They may be hyper-sensitive to criticism one week and able to take criticism in stride another week. The tertiary function can at times be very proficient and at other times be very inept. Through life experience, maturity, and determination the INTJ normally develops more balanced use of the tertiary function in mid-life. Extraverted Thinking (Te) is what balances the INTJ’s dominant function, Introverted Intuition (Ni). Te takes all the insights, projections, and ideas of intuition and puts them into workable plans. Te is focused on objective logic, efficient decision-making, and putting plans out into the external world. Te works in tandem with Ni to make the INTJ strategic, planful, objective, organized, and decisive. When INTJs bypass Te they become lost in an unproductive state, withdrawn from the outer world and disinterested in making any difference in their environment. – As a defense mechanism. The INTJ is defending themselves from the outer world and outer pressures by secluding themselves in their introverted functions. The INTJ has not been given sufficient opportunities to use the auxiliary function, and thus stays in a continual state of seclusion and focus on their introverted functions. If the INTJ favors the internal world to such an extensive degree that they don’t even try to develop their auxiliary function or “get out” into the world, they can loop. INTJs experiencing a Ni-Fi loop can get stuck in a world of theoretical visions compounded by subjective, emotional reactions. They are often called “conspiracy theorists” when this happens. They become suspicious of other people and the world at large. Fi feeds the INTJ emotion-based suspicious, and Ni will go to any lengths to justify those suspicions. B) The friend is cancelling plans and showing up late because she’s feeling sick. Maybe friend needs some help or reassurance. The above example may be kind of extreme, but it gets the point across. Fi feeds Ni emotional reactions and suspicions, and Ni fills in the gaps with any perceptions that might solidify those Fi-based suspicions. Ni doesn’t see the details (friend has morning sickness, friend has dark circles under her eyes, friend isn’t eating normally). Ni just sees an impression (friend is gloomy, distracted, mysteriously absent). Te and Se are left out in the cold and ignored and repressed so that Ni and Fi can continue feeding each other illogical fantasies and beliefs. 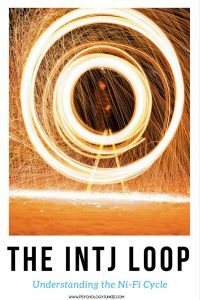 The Ni-Fi loop can also manifest when an INTJ comes up with rules or edicts that they enforce to everyone else. Their emotional/feeling-based values become “facts” and everyone must obey/adhere to them. Other Ni-Fi loop traits: self-centeredness, insecurity, irrational behavior, pre-occupation with a “vision” or idea of what is “really” happening, uncertainty, repeated grip stress reactions. The first step to getting out of a loop is recognizing that you are actually experiencing a loop. This can be difficult initially, because the dominant-tertiary loop can feel “comfortable”. It can seem natural because you’re still using two of your primary functions and in your preferred introverted direction. Whatever you do, don’t go to Extraverted Sensing (Se) to solve the problem. Many INXJs do this, but switching to the inferior function can push you into the “grip” instead of into a healthy functioning state. Going to Se to get out of a loop can cause you to become indulgent, impulsive, and over-focused on sensory experiences in an unhealthy way. To get out of a loop, your best option is to focus on your auxiliary Extraverted Thinking (Te). Talk over your state with someone else and ask them if your projections make logical sense. Sometimes just saying your thoughts out loud (extraverting them) can help you to see what you might be missing or what logical missteps you’ve taken. Use Te to make a difference in the outer world. Structure and organize your day. Focus on attainable, logical goals and make a roadmap for how you will reach them. Play chess or another strategy game. Do things that force you to use logical, objective thought in an externalized way. Talk to people, work out plans, write out your plans, record yourself speaking through your ideas and visions and then listen to yourself and decide if what you’ve said makes sense. Just try to activate Te and re-introduce it into your daily life. As you do this you will start to get out of the loop and enjoy a more balanced, healthy, pro-active state. Have you ever been in a loop? Do you have any suggestions for getting out of one? Let us know in the comments! Definetly experienced the Loop. My behaviour makes so much sense now. Thank you so much on publishing this article. This will help me in the future. Thank you. I can say, it is the darkest experience you make if your very best friend hates you bc you were mistrustful. You sink in a hole of guilt and self doubt. I’m happy to know now, what’s happening, because I was working all the time on my surprising behaviour and emotions. I never felt such intense feelings. I’m glad you enjoyed this! !